Provide comfort for the family of Jeanine Lyon with a meaningful gesture of sympathy. 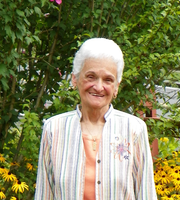 Jeanine “Jean” D. Lyon, 84, of Sugar Hill, Dalton, formerly of Pittsfield, died Wednesday, March 27, 2019, at Berkshire Medical Center. Born in North Adams on May 17, 1934, a daughter of Theodore W. and Emily G. Andrews Devine, she was educated in North Adams and was a 1952 graduate of St. Joseph High School. A Korean War veteran, she enlisted with the United States Air Force on September 22, 1952, earned the rank of Airman Second Class, and was honorably discharged on June 20, 1955. Mrs. Lyon was employed for ten years as a sales associate at Roxwell Pets in the Allendale Shopping Center. She retired in 2009 at the age of 75. Prior to that, she had worked at J.C. Penney for many years. Mrs. Lyon was a communicant of St. Charles Church. She volunteered her time at Berkshire Medical Center and with baseball teams at Wahconah Park. She enjoyed animals, especially puppies and kittens. Her husband, C. Frederick Lyon, died December 7, 1995. Mrs. Lyon is survived by a sister, Rosalie Allen, of North Oxford, Mass., several nieces and nephews, as well as her caregivers and friends, Barbara and Grant Gagnier and Carol White. She was pre-deceased by a sister, Jacqueline Devine and a brother, David Devine. the staff of the Step Down Unit at Berkshire Medical Center for their kind and compassionate care. FUNERAL NOTICE: A Liturgy of Christian Burial for Jeanine D. Lyon will be held Saturday, April 6, at 10:00 a.m., at St. Charles Church, celebrated by Rev. John Tuohey. Burial with military honors will follow in Pittsfield Cemetery. There are no calling hours. In lieu of flowers, memorial contributions may be made to Eleanor Sonsini Animal Shelter in care of DERY FUNERAL HOME, 54 Bradford Street, Pittsfield. To send flowers in memory of Jeanine "Jean" Lyon, please visit our Heartfelt Sympathies Store. Donations are being accepted for: FRIENDS OF ELEANOR SONSINI ANIMAL SHELTER INC.
We encourage you to share your most beloved memories of Jeanine here, so that the family and other loved ones can always see it. You can upload cherished photographs, or share your favorite stories, and can even comment on those shared by others.